Accra, July 1, GNA- "Sir" Cecil Jones Attuquayefio, head coach of the Benin National team, the Squirrels has resigned his post in protest after the Beninios Football Association failed to fulfil promises made to him. In an interview with the GNA Sports in Accra on Thursday, the coach said he was left with no alternative but to resign after all attempts to have the Beninios fulfil their end of the bargain fell on deaf ears. The coach who is already in the country said the protest resignation does not mean he had severed all relationship with the Benin Football Association but that he is prepared to finish off the rest of his contract with them if steps were taken to settle the unfulfilled promises. Coach Attuquayefio did not say the amount or the specific promises his employers had reneged on but said they were all enshrined in his contract signed with the Benin Football Association in 2003. Jones Attuquayefio as it would be recalled was the first coach to have qualified the Beninios to a major soccer competition when he masterminded their qualification to the recently held African Cup of Nations in Tunisia. His contract with the Beninios Football Association runs out at the end of September this year. 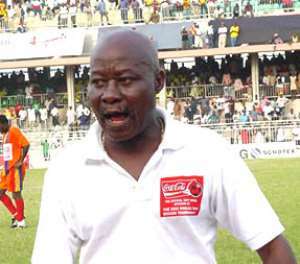 Jones was adjudged the best coach on the Continent in 2001 by the confederation of African Football (CAF) after guiding Accra Hearts of Oak to win the double when they won the CAF Champions' League and the Super Champions trophy in 2000. On the Local scene, he coached Accra Hearts of Oak to four successive league titles in addition to two FA Cup triumphs before moving camp to join Dansoman-based Liberty Professional briefly before the Benin deal.